I got out of my hammock and stirred the fire and found I still had hot coals; after adding some kindling I had a good fire going. I prepared my breakfast, instant oatmeal, a banana and hot chocolate. I placed my small pot filled with water over the fire and soon it was hot. The hot oatmeal and hot chocolate felt good on the chilly morning. After finishing my breakfast I started packing up, I was going to meet up with my friend Tim to hike the second day’s leg back at my car. I let the fire burn down and spread the coals apart to let it cool. I took a bucket down to the stream and got some water and doused the remaining coals. I turned on my GPS and reset the stats in preparation for today’s hike, unfortunately I didn’t realize that it also deleted the track from yesterday. So now I had lost the track and my phone was down to under 20% charge; the morning was not starting out well. To add insult to injury the batteries in my camera were also dead – and they were my backup batteries too. 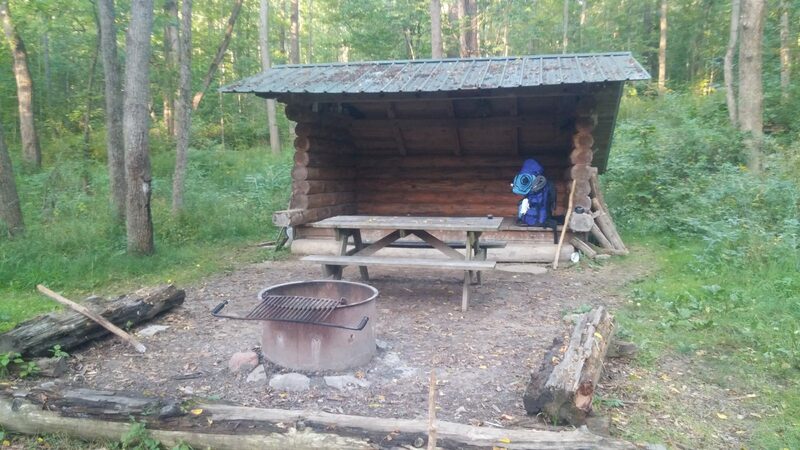 I took a single photo of the lean-to on my phone and then headed up the trail back to my car (mile 0.0 – 7:34 am). It was a little over a mile back to the car. Tim was running late, which worked out well because I could let my phone charge longer. By the time he arrived my phone was almost to 40%. He also had a set of spare batteries that I could use for my camera. 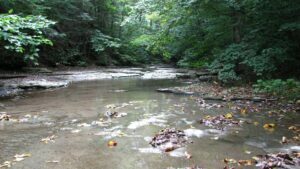 We started out (mile 1.2 – 9:19 am) and headed back across the stream at Ebenezer’s crossing; pausing so he could take pictures of the waterfall. Then on up the Buck Settlement cemetery for a few more pictures. We continued on up the trail for a short ways and he realized he had left his walking stick back at the waterfall when he had taken pictures, so we turned around and trooped back, retrieved the walking stick and headed back up the trail. The trail was relatively easy and wound its way along for a little over 3 miles before opening out on CR 21 (mile 5.1 – 11:04 am). The sun was bright and there was barely a cloud in the sky. We stopped at the edge of the road and had some water before moving on. 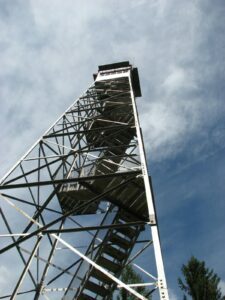 A mile after leaving CR 21 we came to the trail junction for the Sugar Hill Fire Tower. 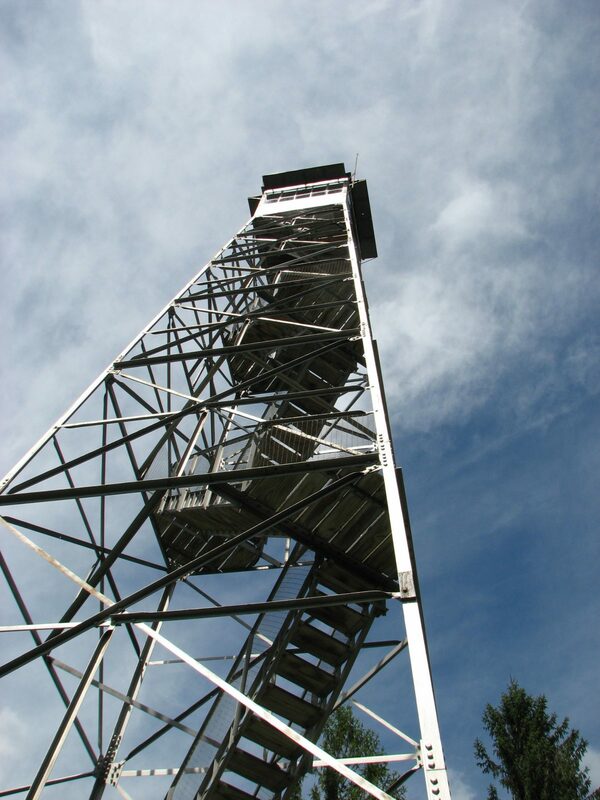 We left the FLT and headed up to the fire tower, our turn-around point. As we climbed the trail up it opened out to some basic horse stalls and a campground to our left. We crossed through some empty campsites and over to the tower and sat down in some shade (mile 6.9 – 11:57 am). After drinking some water I started up the stairs of the tower. The observation deck was closed and locked, so I took some pictures of the view from the stairs and then climbed back down. We decided to relax and eat our lunches at the base of the tower. While we were eating the ranger came up, we asked him if he could unlock the observation deck and he said yes. He informed us that the tower was 75 feet to the top and 68 feet to the floor of the observation deck. I followed him up to the top and took some more pictures through the dusty glass. It was quite warm in the top. 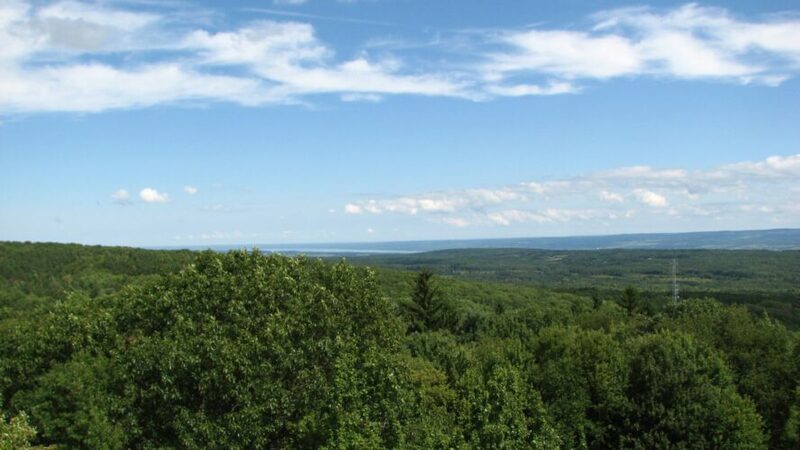 After both Tim and I had taken our turn getting pictures in the tower we got ready and headed back down the trail. It was an easy walk back down to the junction of the FLT and we quickly found ourselves back at CR 21 (mile 8.5 – 1:58 pm). We crossed over and continued on at a good pace. We paused for a quick drink of water about 1.5 miles from the trailhead at Templar Rd before moving on again. We met some women at the primitive campsite next to Ebenezer’s Crossing cleaning up the site. We chatted with them for a few minutes. One of the women was planning on through-hiking the FLT in the near futures. I recommended getting a camping hammock; one of my best investments. We left them to finish their work and crossed the stream and climbed up to Templar Rd. After a short walk down Templar Rd and up Vanzandt Hollow Rd we were back at our cars (mile 12.0 – 3:40 pm). It was an easy hike, but I was ready for a hot shower and my own bed. It had been a good two days, the weather had been good for the most part.